This easy to make (no appliances needed!) recipe is a great summertime lunch treat. 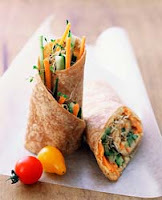 Place ingredients in the center of the wrap (for an extra touch, heat up the wrap in the microwave first for approximately 30 seconds), fold, and eat. Although it might not seem like a filling meal, the combination of high fiber and heart-healthy fats is guaranteed to keep you full for hours. Even my most carnivorous friends have been surprised at how great this wrap is and how full they feel afterwards. As an added bonus, the medley of vegetables provides a plethora of vitamins (including A, C, and E), minerals (such as potassium and magnesium), and antioxidants. Goes great with a chickpea, cucumber, and cilantro salad.